The new 10th Edition covers the enormous changes brought on by the Leahy-Smith America Invents Act and includes searchable electronic appendices with a comprehensive, cumulative case digest. This is Irah Donner’s “magnum opus” for patent attorneys and IP professionals – a must-have, all-in-one comprehensive reference. In the new 10th Edition of Patent Prosecution: Law, Practice, and Procedure, you’ll find in-depth coverage on significant changes in patent law resulting from decisions of the Supreme Court, the Federal Circuit, and the Patent Trial Appeal Board. This new edition places new substantive discussions in context with existing patent laws and regulations. You’ll also save valuable time and precious resources with the in-depth analysis of prosecution rules from the U.S. Patent and Trademark Office. Patent Prosecution: Law, Practice, and Procedure, Tenth Edition is the only resource that gives you an element-by-element analysis of patent law issues that trigger rejections by the USPTO. Utilizing years of research and practical experience, the author provides you with proven response strategies. 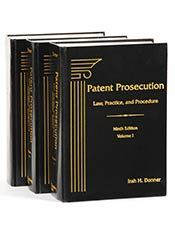 Patent Prosecution: Law, Practice, and Procedure, 10th Edition includes accompanying searchable electronic appendices and a comprehensive Cumulative Case Digest with an extensive compilation of precedential language, organized by specific issue, in favor of patentability – giving you fast access to a powerful tool for crafting claims and ensuring patent prosecution affords optimal protection. In short, this 6,700-page reference is the one resource all patent practitioners need to ensure a comprehensive understanding of the latest cases, USPTO rules and procedures, and precedents. Cardiaq Valve Technologies, Inc. v. Neovasc Inc., in which the Federal Circuit held the mere contribution of public knowledge, which could have been easily obtained by the named inventor, does not make one a co-inventor. Rembrandt Wireless Technologies LP v. Samsung Electronics Co., Ltd., where the Federal Circuit held that a disclaimer of a claim cannot serve to retroactively dissolve the marking requirement for a patentee to collect pre-notice damages under 35 U.S.C. § 287(a). The accompanying searchable online appendix updated for the 2018 Supplement offers a comprehensive Cumulative Case Digest with an extensive compilation of precedential language, organized by specific issue, in favor of patentability. Technology Transfer Tactics is proud to partner with Bloomberg BNA to bring our customers access to this comprehensive and authoritative resource. All Bloomberg BNA are written by respected experts with extensive experience in patent law and IP licensing. These renowned authors draw from their wealth of professional expertise and in-depth research to deliver the most highly regarded editorial quality in the industry. The author of Patent Prosecution: Law, Practice, and Procedure is Irah H. Donner, a partner in the Intellectual Property department of Manatt, Phelps & Phillips, LLP, New York, NY. He concentrates on patent prosecution, technology audits, intellectual property transactional due diligence, and transactional work, including licensing and development agreements and litigation support.